Instead of ordering a greasy, high-calorie pizza to your house for dinner, make your own! 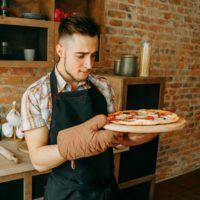 Most grocery stores sell pizza dough that is ready to be cooked, so all you need to do is figure out what you want on your pizza and you’re good to go! Check out the sprouted and whole grain dough selections or use your favorite flatbread. With DIY pizza, you’ll save calories and money while creating a dish just to your liking that will also keep you on track with your goals. Feel free to get creative too—these healthy pizza topping ideas are sure to satisfy your cravings! « Skipping Lunch? Think Again!